Frank was a coal mining town of around 600 people in 1903. 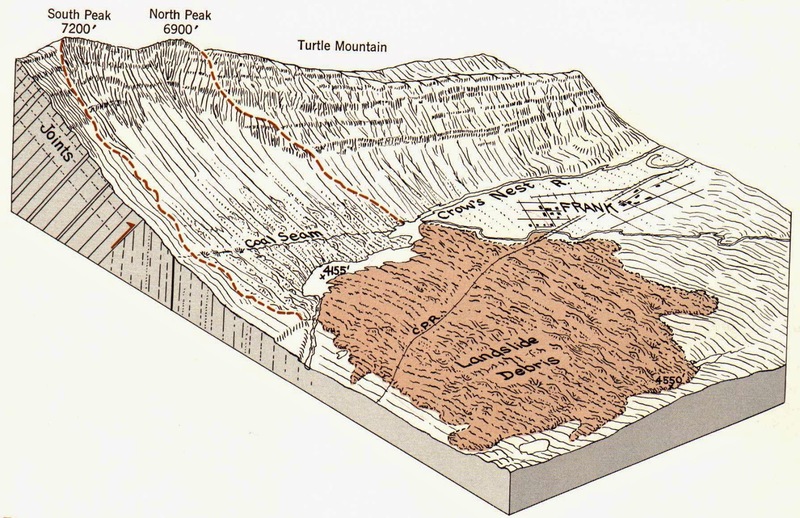 The coal seam ran along the base of Turtle Mountain, so the town was established there as well. The Canadian Pacific Railway also crossed the area on its way to Crowsnest Pass. The local First Nation people did not like Turtle Mountain. They called it the "Mountain that Moves", and refused to camp in the area. The Europeans had no such worries, and mining of the coal was well underway. In the early morning of April 29, 1903, a shift of 17 miners was working deep underground. For weeks there had been strange things happening in the mine. Timbers holding up the tunnel walls would splinter and break for no apparent reason. Coal would occasional "mine itself", crumbling out of the seams overnight when no one was around. Small earthquakes were occasionally felt underground. The miners knew that the collapse of mine tunnels was an ever-present danger, so they may not have been overly surprised to hear the explosive concussion followed by an ominous silence. They were trapped, no doubt by a cave-in. They began to assess their situation. Soon, water was pouring into the tunnels, making a bad situation even worse. The normal passage to the surface was blocked, but one of the miners knew that a second coal seam might be close enough to the surface that they could hack their way out. They started digging for all they were worth, gasping in the increasingly toxic air. One by one, the miners gave out. They weren't dead, but they just did not have the energy to pick up their tools. Only three of them were still working when they broke through to the surface. Rocks were still falling from above, so they couldn't yet escape, but they had fresh air, and they quickly cut another opening beneath a protective overhang. After thirteen horrible hours they emerged at the surface to find their experience was only a part of an even larger tragedy. A gigantic avalanche had buried part of their town, killing between 70 and 90 people. The miners had been given up for dead, so their appearance was some small bit of good news in the midst of the horrific event. It gets to a certain point when driving through the mountain wilds of British Columbia and Alberta that one expects that trees will be growing just about everywhere. The region has plenty of precipitation through the year so things will be green. 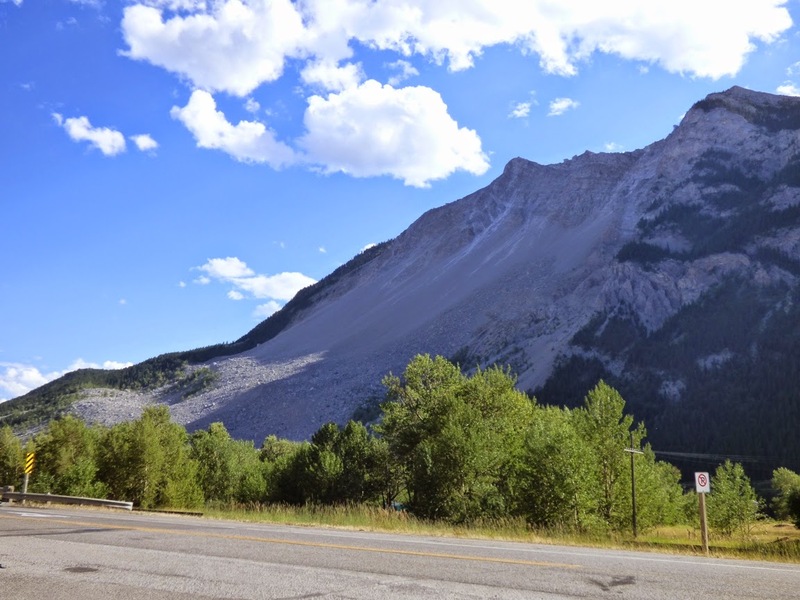 Approaching Crowsnest Pass during our recent Northern Convergence tour, we were struck by the sudden appearance of an absolutely barren slope. 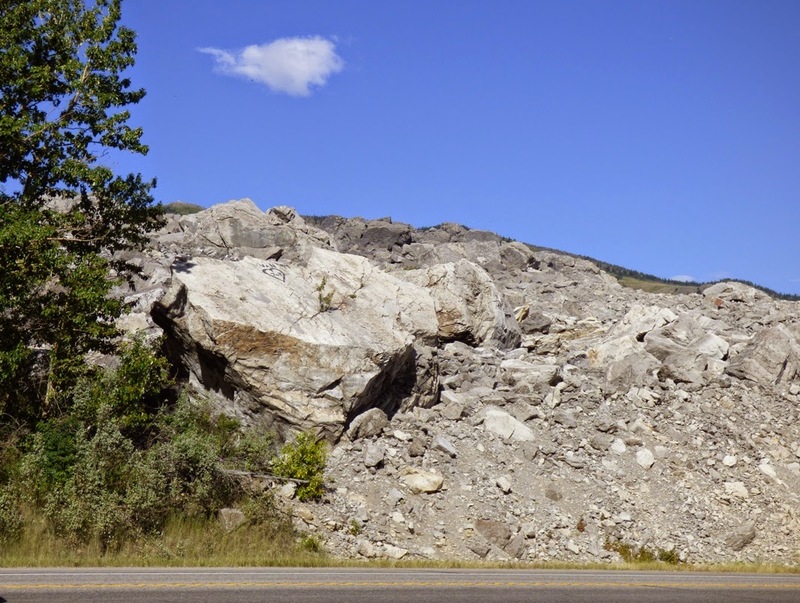 It doesn't take long to realize why, as the highway crossed a huge debris field covered with gigantic boulders. 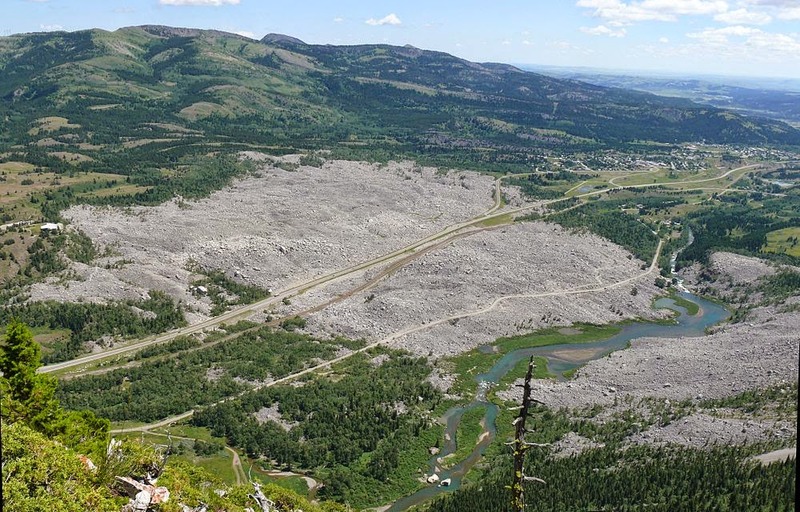 It was the debris avalanche that destroyed so much of Frank back in 1903. The slide was truly epic in scale. Totaling 30 million cubic meters (82 million tons), the avalanche was 1,000 meters (3,300 ft) wide, 425 meters (1,394 ft) high and 150 meters (490 ft) deep. It spread laterally over level ground, covering three square kilometers. The rocks had flowed over the surface like a thick liquid at speeds of up to 70 mph (112 km/hr). The entire event was over in less than 2 minutes. The slide was probably inevitable. The limestone layers had been folded into a huge anticline (upward pointing fold) with thrust faults at the base, on top of weak Cretaceous sediments. 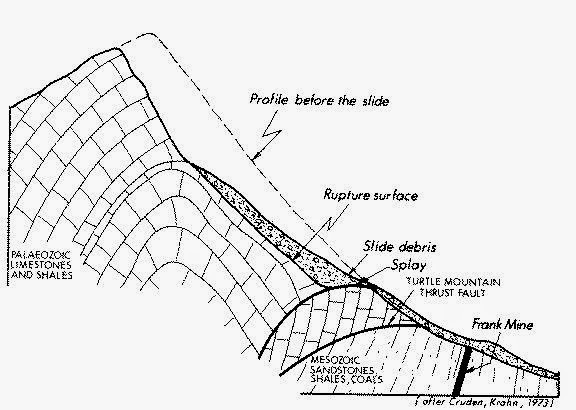 Glaciation had oversteepened the flanks of the mountain. Fissures sliced deep into the rocks allowing water and ice to accumulate, weakening and wedging the rocks apart. The mining at the base of the slope was quite possibly a contributing factor. 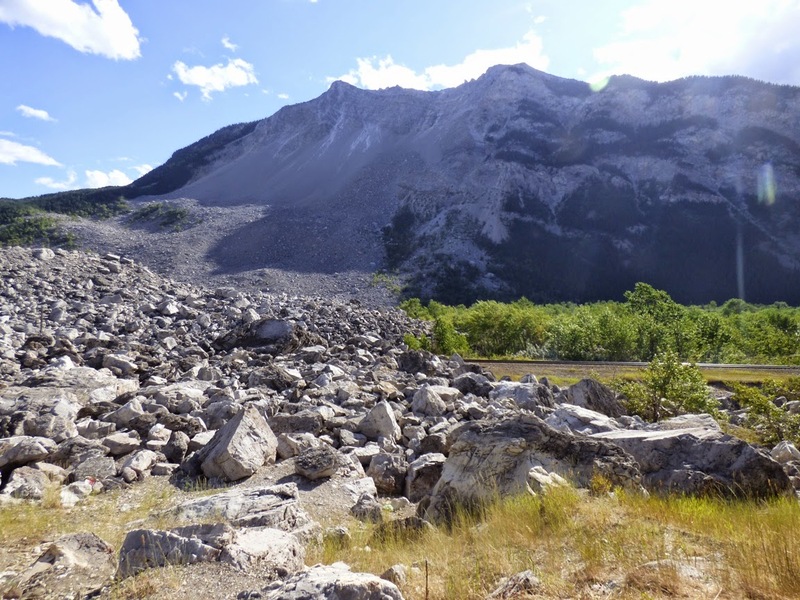 The Frank Slide was the worst mass-wasting disaster in Canadian history. But life went on. The mines were reopened (a horse who worked in the mine was actually found alive after a month underground). The town grew even larger for a few years, but by 1917 the coal mines closed down. Today about 200 people live in the village nearby, and an interpretive center has been constructed that provides information on the extraordinary event. We headed into nearby Pincher Creek for the night. It was our last night in Canada, but we still had plenty yet to see, on both sides of the border..
Great post! For anyone spending time in the area, it's worth hiking the trail to the summit of Turtle Mountain. The trail starts at the north (Blairmore) end of the summit ridge and you end up looking directly down on the slide scarp. There are awesome fissures at the summit (visible on Google Earth) and massive blocks of limestone teetering on the brink. Fascinating! I wish I'd had the time to climb up there. Thanks for the note. Lunar Eclipse of October 8: The "Blood Moon"